DevaCurl is a revolutionary system that allows you to embrace your natural curly hair. Our certified DevaCurl stylists will educate you on styling your hair using the Deva 3 step system: to cleanse, hydrate and define curls. Also, DevaCurl stylists specialize in cutting curls using an innovative technique - a truly customized shape is achieved by first cutting the hair dry and in its natural state, followed by washing and setting. The finished look is finalized by refining and detailing the shape. Semi-Permanent, Demi-Permanent and Permanent color options available. Subtle variations of tone, perfect condition and natural depth – all carefully matched to your skin tone and personality. We carry multiple hues with advanced application techniques to achieve your unique palette. INOA is a revolutionary oil-based, ammonia-free color with no odor, infinite haircolor power and reinforced coverage of up to 100% white hair. Pulp Riot color is a wearable creative Semi-Permanent color line. We carry Neon Shades, pastel shades, and vibrant Crayola shades. These shades are more vibrant, last longer and fade on tone for beautiful creative color combinations. How it works:Balayage is an advanced coloring technique used to create sun-kissed, natural-looking highlights or creative placement. It is the action in which hair color is swept or painted on to the hair to create depth and dimension. Ideal For:Balayage can enhance almost any haircut, length or texture. Balayage is the in-salon color service choice among the most discerning clients – celebrities, models and fashionistas. Need to know:Balayage hair painting isn’t just for Blondes! It is perfect for brunettes that want a subtle, sun-kissed look, for creative shades and even rainbow fantasy shades. Double Flat Iron Process with curl and press that delivers the same silky effect on “natural” hair without heat damage. Hair will feel lighter, full of body and movement while exuding a healthy shine. Best for thick, course or unmanageable hair. DevaCurl set is a customized curl wash and set service using all Deva Curl products and tools. The service will transform your curls creating hydrated and defined curls. Your Deva certified stylist will shape and style your curls plus teach you the fundamentals of daily curl care. This service is great for those who want to embrace their curls. How it works:This cold application technology softens the bond via ultrasound wave technology instead of the traditional thermal method, giving the stylist more application options. The Ultrasonic Cold Fusion method allows for “flat” bond formation, providing seamless color placement and more natural blending results with your own hair. Ideal For: Best to add volume, add length on fine to normal hair. How it works:Strand-by-Strand keratin-tipped and thermal bonded application and is offered in more than 90 colors. Our stylists can customize Ombre shades and Fantasy colors which can fit everyone’s needs and style. SO.CAP. hair comes in three different textures: straight, wavy and curly and three different lengths. How it works: Tape weft extensions are semi-permanent and very quick to apply Tape hair extensions are applied quickly and easily. The pre-taped weft of hair is typically sandwiched on either side of the natural hair. Results are seamless. How it works:Hair Extensions can provide longer, thicker, more voluminous hair in minutes. Ideal For:Looking for quick style change; great for travel and special occasions Need to know:Quality hair and customizable for any occasion! Also known as “a weave”. Hair weave is sewn in to basic cornrows and comes with numerous look and style options. A great protective style for those would like less upkeep for their own hair or for those who want big voluptuous hair. Beautiful square or triangle parted sections of added synthetic braid extensions at any desired length or size. Great for most occasions especially vacations that involve swimming. Elegant small braids throughout the entire scalp with human hair extensions. Great for destination weddings and for everyday wear. Very little maintenance is needed. Also known as feed-in braids. Beautiful goddess jumbo braids with synthetic hair in a desired pattern throughout the scalp. This style is a more casual look. This is an imitation of locks (dreadlocks). It is a wrapping technique of synthetic hair around an individual braid leaving an illusion of locks. Great style to start the process for achieving locks. Individual ringlets of hair throughout the entire scalp that are NOT combed, nor can be combed. This is a lifestyle/hair change. A beautiful natural look offering numerous look and style options for maintenance upkeep. This look is great for all occasions. A technique of crocheting desired hair onto basic cornrows. Crochet hair comes in many different styles or forms. This is a very low maintenance hairstyle and a great everyday look. Cornrows with synthetic extension. Can be designed for elegant fashion or a more casual look. Easy maintenance style which offers various look options. Oribe’s crème de la crème deep-hydrating masque transforms even the driest, most over-it hair, leaving it supremely soft and irresistibly touchable. This deep treatment repairs and protects and is weightless. Signature Masque is Paraben free, offers UV protection and is color safe. Best for dry damaged hair. Designed to infuse hair with much-needed hydration leaving it soft, silky and manageable. Tthis Moroccanoil hydration treatment drenches dry and damaged locks with moisturizing red algae, vitamins and antioxidant-rich argan oil. Great during winter months or in dry climates. Best for dry hair. The ultimate scalp treatment to detoxify, soothe and balance a dry or oily scalp. Depending on your scalp needs, a thorough application of Moroccanoil Dry Scalp Treatment or Moroccanoil Oily Scalp Treatment will be recommended. Features lavender, geranium and ginger root essential oils to soothe and balance, with the brand’s signature argan oil to nourish. Great during winter(Dry) or summer (Oily) months. Concentrated active ingredients freshly fuse to create a customized in-salon treatment for your specific hair needs. Capable of resolving all of your hair concerns, Fusio-Dose™ Hair Lab fundamentally treats your hair and immediately transforms for lasting results. Goldwell color serums are a post color treatment option that locks in color instantly and amplifies color luminosity. This weightless leave-in treatment works to ensure color durability and longevity. Professional blow dry to loosen or straighten original hair curl pattern, leaving hair more manageable to style as desire. Professional blow dry to straighten hair followed by an iron press giving hair movement and shine leaving hair silky straight. Suits most occasions. Customized based on the needs of the hair. Detoxify, soothe and balance a dry or oily scalp. Individual natural braids throughout the entire scalp. More of a vacation style or good protective style for wig wearing. Great style to start locks. Two strand natural hair twist throughout the entire scalp. Great protective style to wear as is or for wig wearing. Great style to set under the dryer and loosen, leaving hair with a beautiful pattern of waves. Plaiting hair in a braid pattern along the scalp. There a many desired patterns or sizes to choose from giving a more casual look. Maintenance and upkeep of pre-existing locks. Our DevaCurl stylists specialize in cutting curls using an innovative technique. A truly customized shape is achieved by first cutting the hair dry and in its natural state, followed by washing and setting. The finished look is finalized by refining and detailing the shape. How it works:Using an innovative, ionic waving lotion the American Wave product penetrates the hair shaft gently, without roughing the cuticle or making it swell. The ionic lotion reduces stress on tresses, creates a smoother cuticle, and makes hair fabulous and full. Instead of setting hair with hard tools, we combine soft tools with editorial techniques, so looks are fashion-forward, not frumpy. Ideal for:Healthy fine hair, natural or slightly wavy hair looking for a semi-permanent creation of wave, curl, volume or added fullness to the hair. Need to know:Best to create semi-permanent beach waves or loose waves; great before vacations for a low maintenance style. Consultation recommended. How it works:Kerashine Conditioning Anti-Curl advanced curl remover will be applied in one step. This frizz controller, and antihumectant builds strength, improves condition, and creates shine. Ideal for: Medium to thick hair looking for smoothing and frizz control. How it works:Using Bio Ionic’s ReTex thermal straightening system your hair will permanently retexturize and transform to straight hair. How it works:Hair relaxing treatment is a permanent process of rearranging the structure of extremely curly hair into a smooth straight form. How it works:Personalized blow out same day keratin treatment. This customizable, zero-downtime treatment is powered by K-Pure Juice, a proprietary juice blend of keratin, botanicals and amino acids. Ideal for: This treatment caters to today’s trend of embracing one’s own natural hair texture by offering different finish options-from straight to smooth to curly. How it works: Perfection Smoothout is a patent-pending formula that allows hair to be instantly and safely transformed form coarse, unruly, curly and frizzy to smooth, manageable, soft and shiny with no risk to health, hair, or the environment. Results last 8-10 weeks. Need to know: Great Alternative to Full Keratin and can color and wash same day. How it works:Keratin is a smoothing treatment designed to reduce frizz up to 95%, add shine and restore hair from chemical damage for a minimum of three months. The propriety formula is comprised of ceramides and keratin and is 100% formaldehyde and aldehyde free. How it works:Express Keratin is a smoothing treatment designed to reduce frizz up to 50-70%, add shine and restore hair from chemical damage for 4 weeks. The propriety formula is comprised of ceramides and keratin and is 100% formaldehyde and aldehyde free. Need to know: Color services can be done on the same day! G2O is proud to feature Trish McEvoy cosmetics. A room designed to cater to those looking to relax and enjoy a luxurious salon experience in the comfort of their own privacy. Available by within usual salon hours and by appointment only, this private salon room has its own shampoo sink and styling station. $50 per hour on top of your regularly priced salon service. G2O now offers “Text-to-book”? 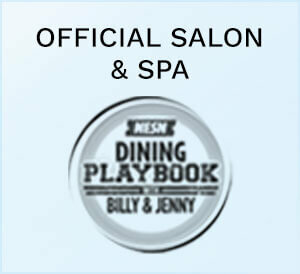 Text us at 617.262.2220 to confirm or book appointments during regular business hours. G2O's team of professionally trained hair stylists and makeup artists provide the leading salon services in New England, leaving clients looking and feeling their best. The talented and creative team includes awarded professionals such as Boston Magazine's Best Wedding Hairstylist, a recipient of Boston Herald Beauty Award recipients, Trish McEvoy trained makeup artists, members of the Goldwell Show Team, as well as Goldwell Educators and R + Co Educators.